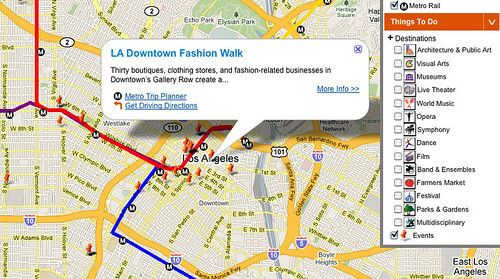 Experience LA's new Google maps mashup presents events and transit alongside eachother. Even though I visit the Experience LA website every week to help compile our Go Metro Weekends guide, I didn’t find out about their awesome new Google maps mashup until last week when LAist had a post about it. Granted, the map has only been around for a few weeks, having launched over Thanksgiving, but still – I should be on top of this stuff! For those of you who have yet to discover Experience LA, it’s a website (partially funded by Metro and other local sponsors) that compiles an absolutely massive amount of information on cultural events and attractions across the Los Angeles region. And I do mean massive — a look at their calendar on any given day usually provides a list of more than 100 events. In addition to the huge database of events and destinations, what makes Experience LA really stand out from other Los Angeles event listings is its emphasis on transit accessibility. Experience LA’s new interactive map takes the merging of area cultural events and transit awareness to a whole new level.The map is a mashup of Google Maps technology, Experience LA’s event database and Metro’s publicly available transit data. According to Julie Nguyen at Experience LA the idea for the map had been around for quite some time but it wasn’t until Metro released its transit data publicly this past summer that developers began actually working on the map. And visualize it does, better than any other attempts (including my own) that I’ve seen. The map is found on the Getting Around page of the Experience LA site and can also be viewed as a standalone web page for users who would like a little more room to play. An interactive legend on the right side of the map is the key to its power. Users are able to toggle events and destinations that appear on the map with a click of a mouse. There are 14 destination categories (including Public Art, Museums and Farmers Markets), each with its own unique icon and a category called Events that displays all events happening within the next two weeks. There’s also a section of the legend that allows users to toggle certain transportation features on the map, including Metro Rail and area airports. When a user clicks an Events or Destinations item in the legend, a collection of stylized orange circles with numbers appear across the map. These circles represent clusters of events or destinations and the numbers tell how many events/destinations are located within the cluster area. Double clicking on a circle will zoom in on the map in typical Google Maps fashion. Once a user zooms in close enough the circle will disappear and the icons of the selected categories will appear on the map in the exact location of the each event/destination. Users can then click on an icon to learn more about the event and are provided with links to the Metro Trip Planner and driving directions – in that order. Stylized circles with numbers represent clusters of events. It’s really rather brilliant and intuitive, and according to Experience LA events are updated in real time. In other words, if an event is entered into the database that is happening within the next few weeks, it will instantly appear on the map. The Metro Rail overlay is incomplete — it’s missing the Gold Line Eastside Extension! Limiting the transit overlay to Metro Rail ignores the 200 bus lines that make up the bulk of Metro’s system. I know it’s a lot of work, but I’d love to see overlays of individual bus lines. And I think the rail lines should be broken up individually as well. While the Metro Trip Planner is okay, there’s no way to use the more useful Google Transit planner from the map. Experience LA readily admits the map is a work-in-progress and is aware of some of the more glaring issues like the Gold Line Eastside omission (the data only recently made its way to Google, therefore wasn’t implemented in time for launch). They have no shortage of ideas for the future, including better search capabilities, the ability to focus the map by zip code and adding restaurants, among other ideas. I asked about the possibility of a mobile app or allowing the map to be used by other sites (like local businesses or organizations) and while there are no concrete plans, Experience LA is open to the idea. Feedback so far from their partners who contribute event data has been positive and they are eager for feedback from users. Comments can be sent to info@experiencela.com or by visiting their contact page. As a transit rider and technology fanatic, I love this interactive map. It’s a great step forward in using technology to further transit awareness in this car crazy town, and I think it’s the best local use of Metro’s transit data so far. People love to go out and if they’re able to see how many great events are easily accessible by Metro, that can only be a good thing for the future of L.A.